Oddities of living in Space | WhatPoll? The vast expanse of space begins (according to NASA) just 50 miles above our heads. Despite this relatively short distance, it is the most hostile and alien place known to mankind, and a very strange experience to the handful of people in our species that earn the chance to visit it. Astronauts not only have to contend with the severe physical challenges placed upon their body, but also un-natural psychological conditions, and a completely new dynamic in which to conduct their lives. Over the last fifty years since Yuri Garagin was the first human successfully launched into space, astronauts have been pushing the boundaries of what scientists previously thought was realistically achievable for the body to endure in such a harsh environment. In short, leaving planet Earth is not as glamorous as Hollywood might have you believe. In fact, just the quality of life would deter a lot of people from such a trip, let alone the risk of death. Here is a glimpse of the oddities of space life. Toilets in space have various restrains (foot loops, thigh restraints, etc.) so that astronauts will not float away when he/she is using it. Also, due to weightlessness, the toilets rely on air and vacuum pump which creates suction to remove the waste. When urinating, astronauts use a large tube that is connected to the bottom front of the toilet. This tube also has air circulating through it carrying the urine to a holding tank. Anatomically correct urine funnel adapters are attached to this tube so that both men and women can use the same toilet. Space sickness or officially known as “Space Adaption Syndrome” is a problem that many astronauts are begrudgingly far too familiar with. Roughly half of all astronauts experience this phenomenon during their first few days of a space mission. To elaborate, back here on good old Earth, the human body developed its method of sustaining spatial orientation through the presence of gravity on sensors in the inner ear known as the otolith sacs. Gravity is a constant force, so by this method, if you were to change from standing up to lying down on your side, you will be aware your head positioning had changed even with your eyes closed. Space sickness is caused when the astronaut experiences the visual sensation of movement, but no corresponding gravitational vestiblar stimulation. For many, the body will adapt its physiological processes for managing orientation over time, and the astronaut can begin to feel normal again. For the unlucky, space sickness is just a part of the job. 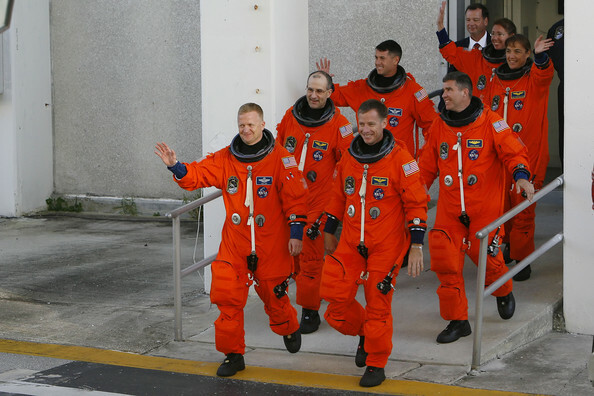 Did you know that astronauts are up to 2 inches taller while they're in space? As soon as they come back to Earth, though, they return to their normal height. What happens in space is not an optical illusion, but one more example of how microgravity affects our bodies. There are two theories to explain why the spine gets longer, both of which are based around the elongation of the spine. Regardless of the reason, there are two types of change seen in an astronaut's height while in space. The first change is seen as soon as the space vehicle goes into the orbit. That is when most of the elongation takes place. The second is a smaller, more gradual change over time. This gradual relaxation of the spine eventually stops. If astronauts stayed in space forever, they would not continue to grow and grow. For the most part, astronauts' extra growth doesn't cause a problem. Astronauts may have plenty of food to eat, but being in space can put a damper on their appetites. Without gravity, food aromas waft away before they make it to the nose. When you can't smell food very well, you can't really taste it, either. And because fluids tend to rise to the top half of astronauts' bodies, the crew members usually have perpetually stuffy noses. Salt, pepper, ketchup, mustard and mayonnaise are available to enhance the flavor of the food, but even then, the condiments are different from their terrestrial counterparts -- salt and pepper have to be suspended in liquid so the particles don't float away. Re-adjusting to life on Earth is a frustrating, yet somewhat comical experience for many astronauts. As you can imagine, after living in space for months, you would be quite used to not putting objects on a table, but just letting them float around near you for convenience. Trying this back on Earth has led to quite a lot of accidents involving broken mugs, bottles and equipment by astronauts forgetting themselves momentarily. In addition, they also now free to pee standing up (or sitting down if you are a lady) without the need for various contraptions to make sure the urine and excrement doesn’t float off somewhere. In space, people wash their hands with less than one-tenth the water that people typically use on Earth. Instead of consuming 50 liters to take a shower, which is typical on Earth, astronauts will use less than 4 litres to bathe. When astronauts want to take a shower, they step into a cylindrical shower stall and close the door. They then get themselves wet and wash up just like you would on Earth. However, due to weightlessness, the water droplets and soap don't flow downwards into a drain, they float about. Astronauts use a suction device to get rid of the waste water. Astronauts orbiting Earth see a lot more sunrises and sunsets than those of us stranded here on the surface. They circle the planet every 90 minutes, and the sun just keeps coming and going behind the Earth. Because of this unnatural pattern, the astronauts are given timely and scheduled sleep timetables that are co-ordinated by the space agencies back on Earth. Otherwise, their body clocks would be completely messed up by this bizarre occurrence. Many astronauts take pictures of these stunning sunrises as a past time. Astronaut-physician Dave Williams generated a lot of Outer Space noise while he was aboard U.S. shuttle Columbia in April 1998. 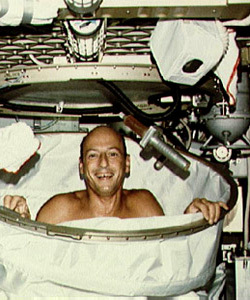 Officially, before his sleep study, the astronauts didn't know they could snore in space. In fact, researchers weren't sure whether gravity was required for snoring. They didn't know whether sleeping astronauts inhaled and exhaled less air in space, or whether they had to expend more effort to breathe.To find answers, Williams and three other medical men wore microphones and other paraphernalia to bed aboard Columbia. One of the pieces of gear was a head net with electrodes to measure brain waves. Ausio recordings of their orbital snoring was compared with recordings of their Earth-bound snoring before the flight.